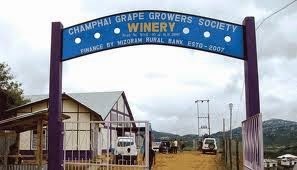 Aizawl, Jan 28 : Mizoram's Champhai Grape Growers Society (CGGS) and Radiant Manufacturers Limited signed a deal in Guwahati yesterday in which the Guwahati-based wine making company agreed to buy 3.6 lakh litre of concentrated grape juice from the CGGS annually. Lalremsiama, Sub Divisional Horticulture Officer and Managing Director of the CGGS told PTI over phone that the agreement was inked on behalf of the Radiant Manufacturer Limited by its Director Roshan Chand and three representatives of the CGGS. The Radiant Manufacturers Ltd, which used to procure concentrated grape juice from Goa would now buy from Mizoram-Myanmar border Champhai district. The grape growers, which established its own winery at Tlangsam village in Champhai district, were worried that their sales would plummet after the new liquor law replacing the stringent dry law was in place in Mizoram for the first time in 17 years. Thangseia, general secretary of the CGGS opined that disposing around 15,000 quintals of grape expected to be produced this year would be a difficult task after the change of the state government's liquor policy and the deal with the Guwahati-based wine-making company was a welcome step.